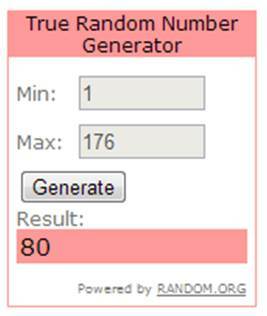 Congratulations Andrea and thank you to all who entered!! Oh my gosh I absolutely love that skirt and bag!! It's too bad I couldn't enter into this giveaway as I live in Canada! I love it all! Incredibly well curated. Can't pick one thing. What a great collection! I'm loving the grace Kelly dress in navy and the anchors away arm party bracelet. What a great giveaway! I would love the Grace Kelly Dress in black. So elegant! I love the Mini Whimsy Skirt and the Grace Kelly Dress! Definitely the Grace Kelley dress in black with the St. Thomas sandal! Too cute! I love their totally vintage tortoise sunglasses, and either the grace Kelly dress-black or the balboa island dress. They have so many cute items but I'm crushing on that Twiggy umbrella skirt, the La Jolla Striped Hat and the Anchor's Away Bracelet in Green/Navy! I am absolutely in love with the Twiggy Umbrella Skirt. Here's hoping!! My favorites are the pearls and polka dot chambray dress and the starfish bracelet! Follow on bloglovin! And I absolutely love the twiggy umbrella skirt! I love the Grace Kelly or the Marylin dress! The perfect old hollywood pieces that my wordrobe is screaming for! Oh my gosh! Their stuff is great. The Cardiff by the Sea Maxi dress is adorable… as is the Del Mar hat. I'm obsessed with this website! I love the Catalina shirt, the Sew Skinny dress, the Grace Kelly dress, the Mermaid maxi skirt, the Twiggy umbrella skirt….. I may need more than 75 dollars 🙂 Thanks for introducing us to such a good resource for reasonably priced, cute clothing. Best boyfriend sweater (wish I had bought it last fall!) and the catalina shirt. The ruffles and pleats halter dress is adorable! There is so much on that site that I love! I love the Twiggy Umbrella Skirt! I love the peek a bow shirt and Catalina top! Cute clothes at great prices! I love all the pencil skirts and also the ribbon wrap flats! I follow you on twitter and Facebook. Love the Wimbledon dress even if Wimbledon is finished. Also love the skirt on post and the white necklace they show on website with skirt. Awesome giveaway. The Grace Kelly dress is to day for! I'd get the High Stepping Flat! I would probably pick the color block bootie. SO cute! And some of the jewelry too. Follow you on all the social media sites! (@FoodWineFashion or @JaclynRenee). Can I spend all of the gift card on sunglasses from the site?! I am obsessed with all of them! So many to choose from but I think I would love the Wimbledon Dress in Mint or White. Love the anchored in dana bikini. Awesome giveaway!!! Follow you via FB and Twitter. I love the Coronado Dress, the Lahaina Rank Top, the Catalina Shirt, and the Curved Claret Skirt! love the emerald beach bikini.So unique! Love the Grace Kelly dress and the Twiggy Umbrella skirt! Stripes, stripes, stripes! I love the Grace Kelly dress in black and white and the adorable tote bag above! So cute and stylish! I love the Santorini Dress you showcased! I would get the Mission Bay dress and the Maxi with a Swirl dress. I follow you on all the platforms. 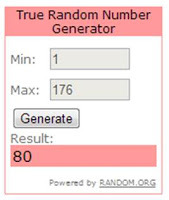 Thanks for another wonderful giveaway! The Ultimate Pearl Statement Necklace is so beautiful and classic. It would be perfect for work! Follow on twitter! I would definitely get the emerald beach bikini and some jewelery. What a great giveaway! This is such an awesome giveaway….I checked out their website & found all their stuff so lovely!!! Good luck to all the participants! It was so hard to choose! But I really love the St. Thomas Sandals and the Cardiff by the Sea maxi. i follow you, love everything at tailor and stylist but would totally get the grace kelly dress! It's so hard to choose! I'm going back into the classroom this fall, and so many of the pieces would be perfect! The Seine Linen dress would be just right for Meet the Teacher Night, the boat shoes look super comfy for teaching all day, the Stanthorpe purse would co-ordinate with everything, and the Bowtique Bracelet is such a fun touch! Hello, thank you for introducing me to Taylor and Stylist. There are so many cute and stylish items. It was hard but the top 3 were Black and white polka dot dress, the anchors scarf (I have the perfect sweater for that) and the starfish bracelet. I follow you on Bloglovin and Twitter. I really like the Hamilton Classic Shirt! I've had my eye on a bold black and white striped skirt for a while now, so that's definitely what I would pick! I follow you on Bloglovin' and Twitter. The bracelet. I tried to buy it when it first appeared on your blog but it is sadly sold out. I follow you on Twitter and BlogLovin! I love the Cardiff by the Sea Maxi (http://www.tands.com/collections/new-arrivals/products/cardiff-by-the-sea-maxi) and it's made in the USA! Thanks for sharing. I would get the The Audra Riding Boots from the site. They are beautiful. Love the Sew Skinny Dress! I follow you on Twitter (@jsmatterings) and I love the Twiggy Umbrella Skirt! I follow on Bloglovin. I'd get the Twiggy Umbrella Skirt if I won. I love the Sailing linen shorts from Tailor + Stylist, although there are many other cute things too! Great post, great contest! Mermaid Maxi Skirt–Summer Edition, and as much of the nautical jewelry as possible. Cute stuff! oh gosh I can't pick a favorite!! I really love pumps you featured! love the bow!! I love that Coronado tank top, I'm a sucker for anything nautical 🙂 I also really like the white and leather trim dress that you've featured on the blog! I follow you on facebook and I LOVE the colorblock cinema dress! Will definitely pin a lot of stuff from this site. Love it and love the prices too ! I love the colorblok dress! Thanks for sharing this Kim! I love the Seine Linen Dress. It's perfect for those hot August days still to come! Absolutely love the clothing and accessories on this site but I would definitely choose the Cardiff by the Sea Maxi! Fits the bill for all my current loves: maxis and stripes! I follow you on Bloglovin! I love everything from their site! If I win I would love to get the Santorini Dress. I love the Savannah dress. Perfect for a work to cocktails type of day! I love the grace kelly dress on the site, such a classic beauty as grace key was as well!! and I'd get the Cardiff by the Sea Dress (love the lines!) and the Emerald Beach bikini! I love the Grace Kelly Dress in Navy! Perfect for a fun date night. I have been eyeing that Santorini Dress (in white) for quite sometime. I would definitely want to add it to my closet. I will subscribe to T&S – great style, low prices. Love the Cardiff by the Sea Maxi. I actually get your blog by email but will add you to y (l o n g!) list on Bloglovin'. I have that skirt from Tailor & Stylist and adore it! I love the Kelly dress. ; ) Thanks for linking up today too! I follow you all 3 ways (Bloglovin' and FB-Andrea Darst, Twitter-@adarst213)and I am obsessed with the Pacific Heights Dress! Fingers crossed!!! I love the Del Mar Hat and the Grace Kelly Dress in black and white. Thanks! I really like the mermaid maxi skirt. I follow you through Bloglovin. Thanks! I follow you on Bloglovin. I love all the unique tops, including the pinup polka dot halter! I follow you on facebook! And I totally would love that emerald bikini, it is so cute! I love the Grace Kelly dress in navy. I follow on Bloglovin. Thanks for the opportunity! I just recently started following you on Bloglovin and I've been coveting the Santorini Dress in White since you posted it on the blog about a month ago. Would love to add it to my summer wardrobe before it's too late! SUCH a good giveaway, I adore with shop! I actually follow all 3 platforms 🙂 If I had to choose just one piece, I'm really loving: the Mermaid Maxi Skirt in black & white stripes. I have a thing for maxis in the summer, can never get enough of them! Um, can I select option "D", I'll take it all?! 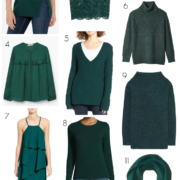 Such cute clothing, and I recognize a few pieces from your wardrobe, PPF! Makes me want to head straight for Greece! The modern flapper skirt and the Seine dress in canary are making me consider jetting off to Paris tomorrow. Love the nostalgia and the vintage feel… and the fact that my friends could totally borrow and make it their own. I'm in love with the white Santorini dress! I follow PPF on facebook and Bloglovin'. I love the Cascading Ruffle Silk Coat from T&S. There are so many lovely things, it's difficult to choose, but I really like the Peek A Bow Tshirt, Anchor Arm Party Bracelet, & the Tailored Tshirt Dress! I love the Sausalito Clutch & the whimsical Starfish cuff. Just a great collection! Thanks for the chance to win. I love the sailing linen shorts and the polka dot pin-up top – so cute and summery! Great items and giveaway! There are lots of items I like, but a few of my fav's are the St. Thomas Sandal, the La Jolla Striped Hat, and the Navy Sailing Linen Shorts. Cute! I follow you on Twitter! I love the Ruffles and Pleats Halter Dress–it's the perfect dress for both work and play! I love the mermaid maxi and the starfish cuff! The Santorini! White of course!!! I LOVE the Grace Kelly dress (black or navy). Such a classic and elegant look and could be styled in so many ways to create a casual look, work look, or an evening out! I love the whole collection. I definitely have my eye on the Santorini dress!! I LOVE those Pasadena Pumps and the Grace Kelly dress in black-they'd make such a cute and classic combo! I would definitely grab both if I won! I follow you on FB and BlogLovin'! Thanks for another great giveaway! Thanks for such a great giveaway! I love the Lahaina Tank in Yellow and the Best Boyfriend Sweater in Black/White!! Love love love the best boyfriend sweater with stripes and faux suede elbow patches! Will have to snag it when its back in stock. Or just get the mermaid maxi skirt to satisfy my need for stripes. It looks very flattering! 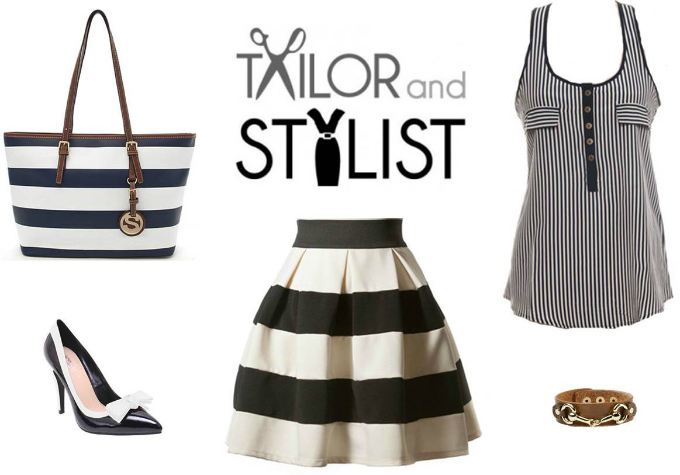 I love the striped tote! Would love to take it on my anniversary vacation! Thanks for sharing! I follow on Bloglovin'! There are so many cute pieces on this website..and so affordable! How could I possibly choose a favorite? I do really like the silky glitter dress and colorblock trench. I follow you on all 3 and I'd LOVE to get the Dana Point Dress! So cute! Already follow you on FB! And on Tailor & Stylist, the Equestrian Chic Genuine Leather Bracelet caught my eye. Classic yet modern. I love the Ribbon Wrap Flats, the VaVaVoom dress, the Forever Sweater, and the Topped with a Bow Pencil Skirt. Way cute stuff and items I can wear to work too! I follow you on Twitter! I would definitely pick the Cardiff by the Sea Maxi dress. What a great give away :). Thank you! 1.) I follow PPF via BlogLovin, Facebook and Twitter. I am smitten over the Dots, Bows, and Heels – Oh My! I would choose the Maxi with a swirl! So cute and so affordable! I love the Grace Kelly dress! Great price too! I love the Solana Beach Shopper, but it's sold out. After that I'd love the Seine Linen Dress and the Hamilton Classic Grey Shirt. Wow this is hard. After a lot of going back and forth, I vote for the mermaid maxi skirt (sorry cardiff by the sea maxi dress, you're in close 2nd). Love the Grace Kelly Dress, and the Twiggy Umbrella skirt as well! I adore the "the sound of summer dress" and the modern roman wedge! Whether I win or not, I'll be shopping there soon!! Following on Bloglovin. Digging the Cardiff by the Sea maxi and the St Thomas sandals! Oh. It has to be the Grace Kelly dress in navy. Already loving this site after your open back B & W top from a week or so back! I'm a follower on all platforms of course, and I love the dapper in dots sundress – so cute! I love the Grace Kelly Dress in Navy and the Dottie with a Bow dress! Love the Twiggy Umbrella skirt! Can't wait til they restock in my size! The Grace Kelly dress in navy is lovely too. Such a great giveaway. I love Tailor and Stylist – especially the Grace Kelly dress in black. I would get the Grace Kelly dress! I LOVE the Seine Linen Dress – so cute for summer! I follow you on Bloglovin', Twitter and Facebook! (and email). Cool giveaway! Too bad I'm in Canada. Following on Twitter, and I would pick the Deco Darling Dress. I love the Darling Dotted High/Low Maxi dress. Dots are my fave, and this lovely dress would work well on my curvy figure. What a great site – I'll be visiting again! I follow you on Twitter and I love the boat shoes and ribbon flats. Great prices for these super cute shoes. I follow you on twitter and would love the boat shoes or ribbon flats. These are super cute and have great prices. The Deco Darling dress is adorable. I've also been eyeing that Lahaina top and Santorini dress for some time! Thanks! I follow you through Bloglovin! That Grace kelly dress is so perfect for spring, summer and fall! Love the items in this store. In LOVE with the Grace Kelly Dress. So classic. I would love to purchase the Maxi with a Swirl dress, the Mermaid Maxi skirt and the mint leather bow bracelet. LOVE them all! Thanks for introducing us to such a great store! Love their style! 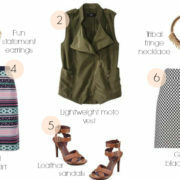 I LOVE the Stand-Out-Style Ruffled Military Jacket and the Catalina Shirt is so fun! I love TandS.com! I own the Savannah Modesty Cap Sleeve Dress and would love the white Jackie Jacket to go with it. But my heart is set on the Maxi with a Swirl, Catalina Shirt in Red and the Sausalito Clutch…just to name a few. I check their website for new items every other day. Thanks PPF for introducing them! I follow ppf on bloglovin' and I LOVE the grace kelly dress! Their shop is so affordable! I thought the prices would be more along the lines of Shabby Apple but most dresses at T & S are half of that! I love the clothes but can't wear them, yet 🙂 however I love the jewelry and shoes. The boat shoes are adorable and I'm in love with the starfish cuff. I follow on bloglovin' and Facebook. I love the Pacific Heights dress. It looks so comfy and cool for summer. I follow on Bloglovin' and I love this duo's site. I would probably snap up that best boyfriend sweater or something in their swim section. Super classic designs! I am super excited about this giveaway! I would totally buy the skirt, it perfect for work along with two of the peek a boo shirts! I follow you on bloglovin! I love the "Wear Your Heart on Your Dress" in mint! Wow, there are so many things I love! I'm thinking the Galleria shirt, the brown Ombre Oversized Cateye sunglasses, and the Bowtique Bracelet in Pink. Either way I'll be hitting up this website again! So cute! I love the St. Thomas sandals. I would definitely go for the Maxi with a Swirl in Navy, love it!! Such a fab collection – love everything they have, and it's all so affordable! I follow you on twitter (stiletto_sequin). I would get the Sicily Sweetheart Dress, Twiggy Umbrella Skirt, and the Amalfi Envelope Clutch. Hope I win! Love their brown equestrian leather bracelet! Do I have to pick one?! Cardiff by the Sea maxi = delish. I'm such a fan of this website. Thanks for introducing me to something new! I absolutely love the mermaid maxi skirt – summer edition! I love the striped skirt, the vertical striped tank and the Coronado cordage tank! I follow you on Bloglovin and twitter! I love the Grace Kelly dress in Navy, Luxembourg cuff and Twiggy Umbrella skirt! I adore what you are doing with your website! Keep up the good work! I love the grace kelly dress! I love the St. Thomas sandals. They are perfect for casual looks or for my work environment. I also love the Pacific Prep top. Following you on Bloglovin and my favorite item is their Santorini dress! There are so many things I love! I would get the Maxi with a Swirl in Navy, Coronado Cordage Tank Top, and the Anchored in Dana Point Bikini. I follow you on Bloglovin' as Meena Rao! I can't decide between the Pacific Sweetheart dress and Dana Point dress. Both are so unique and beautiful! I love love the Bellflower Skirt! I love the Genoa bag & high stepping flats. I would choose the Minted Modern Renaissance Shirt, Lahaina Tank Top, and the Savannah Modesty Cap Sleeve Dress. Lovely clothing!